Auschwitz and the Wieliczka Salt Mine can actually be visited using local public transport. Guides can also be separately hired at these venues. You will spend much less compared to taking a tour. I already had this free and easy visit to Auschwitz and Salt Mine planned but we were too tired (jet lag + dragging luggage up Greg and Tom hostel) so we decided to take up tours offered by Cracow City Tours instead. We took the one-day tour with Cracow City Tours to Auschwitz (6 hours) in the morning and Salt Mine (4 hours) in the afternoon for a total of 190zł per person. 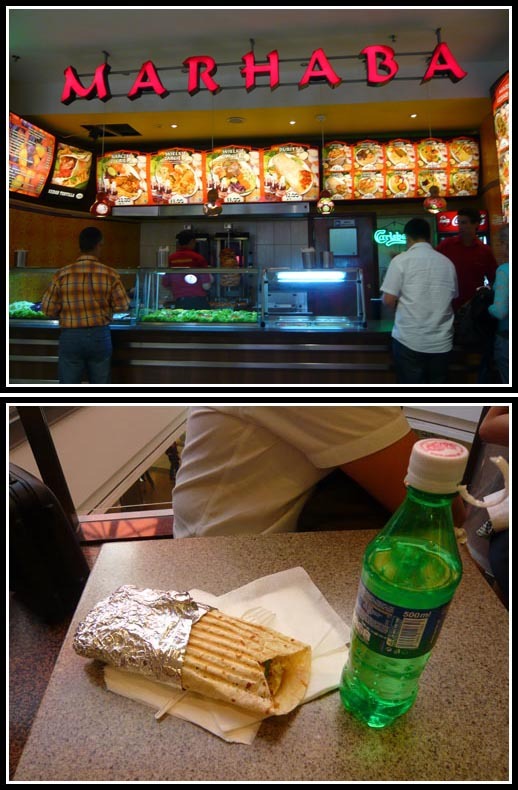 Students enjoy a 20zł discount. The Auschwitz tour included a 53-minute documentary movie shown on the bus – narrated in English (journey to Auschwitz) and Polish (journey back to Krakow) and in very very small French/German subtitles. If interested, you can sign up for their tours at Greg and Tom hostel or the Cracow City Tours website. They offer other tours going to other parts of Poland e.g. Warsaw, Zakopane. 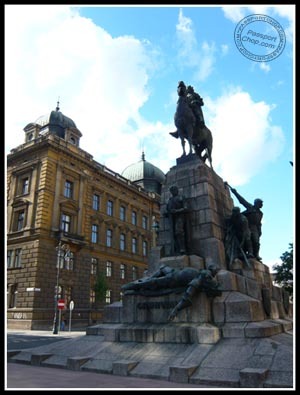 If you are still lost, look out for the following statue along Plac Jana Matejki. Not quite sure what this signifies though – if you know, pl comment to let us know. 🙂 The Cracow City Tour office is along this street. Another prominent landmark to look out for is the Barbakan. Auschwitz-Birkenau was the largest of Nazi Germany’s concentration camps and extermination camps, established in Nazi German occupied Poland. The camp took its German name from the nearby Polish town of Oświęcim. 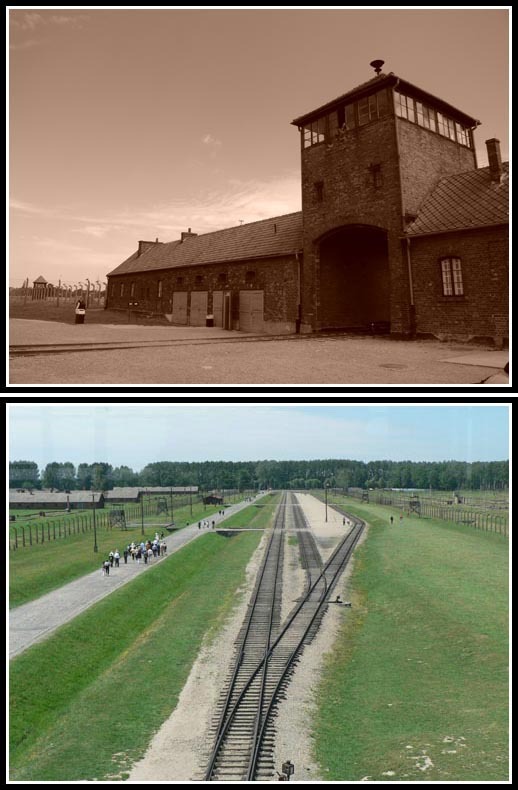 Birkenau, the German translation of pol. Brzezinka (birch tree), refers to a small village nearby, mostly destroyed by the Germans. Following the German invasion of Poland in September 1939, Oświęcim was annexed by Nazi Germany and renamed Auschwitz, the town’s German name. More than 1.1 million people died at Auschwitz – 90% of whom were Jews from almost every country in Europe. Most victims were killed in Auschwitz II’s gas chambers using Zyklon B; other deaths were caused by systematic starvation, forced labor, lack of disease control, individual executions, and purported “medical experiments”. 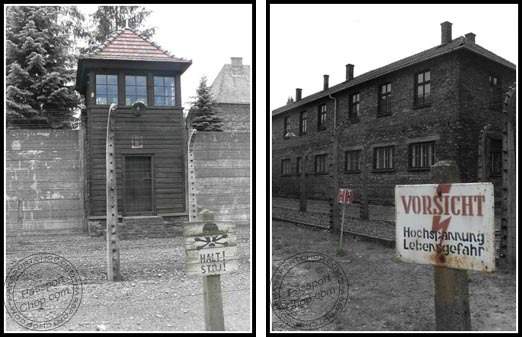 The slogan “Arbeit macht frei” or “work makes (one) free” was placed at the entrances to a number of Nazi concentration camps as a kind of mystical declaration that self-sacrifice in the form of endless labor does in itself bring a kind of “spiritual freedom”. More than 20,000 inmates stayed in this camp and average lifespan of an inmate here was about 3 months – most of them were worked and starved to death – a form of freedom for them eventually. 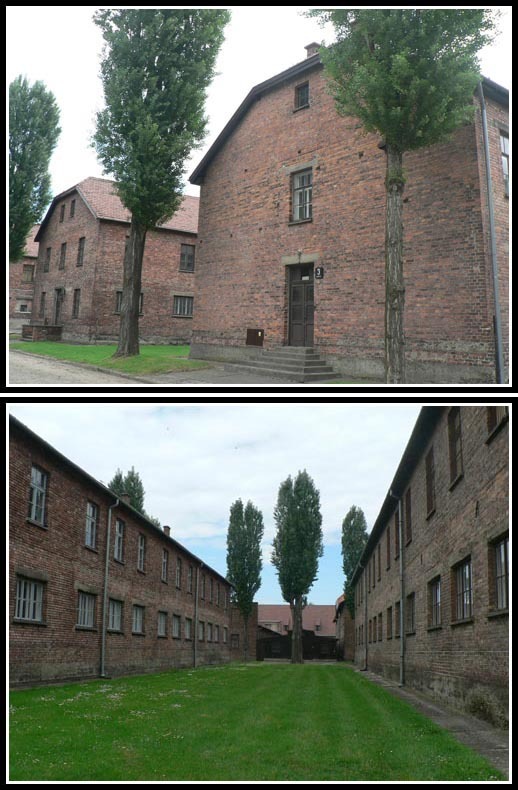 The buildings in Auschwitz are well preserved and the grounds nicely landscaped. Just 60+ years ago, there would not have been nicely manicured grass lawns – the prisoners were so hungry that they would eat any grass, tree bark they find. Blocks 4, 5, 6, 7 and 11 of this camp features permanent historical exhibits including prisoner garments, bunks and other furnishings from prisoner rooms, and items seized from Jewish deportees. Some of the most chilling exhibits can be found in Block 4 and 5 e.g. human hair shaved from prisoners were used to make socks and blankets for German soldiers. There are also thousands of prosthetic legs, spectacles, toys, Jewish prayer shawls. No photography is allowed in these blocks but you can see a sample of these items at the Auschwitz official website. Block 11 is also known as the Death Block. This block served many functions – punishment room (prisoners were starved or forced to stand for long hours in narrow cells), summary court (which usually dealt out death or imprisonment in Auschwitz) and investigation room for the Gestapo (Nazi Secret Police). There were also electric fencing around the camp perimeters which delivered lethal voltages (>10,000 Volts) and currents were employed, continuously rather than in pulses. Some prisoners used the electric barbed wire fence to commit suicide to get out of this misery. Most prisoners were gassed to death. They were led into chambers with fake shower heads, being tricked by the guards that they would be taking a shower. Solid pellets of Zyklon B were then dropped into the chambers through vents in the side walls and the roof. When exposed to air, the pellets released poisonous hydrogen cyanide, killing anyone in the chamber within 20 minutes. 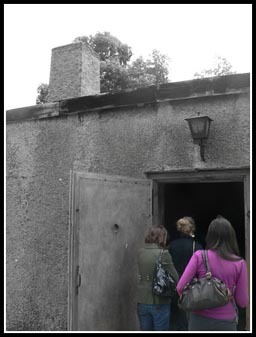 The gas chamber in Auschwitz I Camp was converted into a morgue and crematorium after more advanced gas chambers were built in Birkenau. 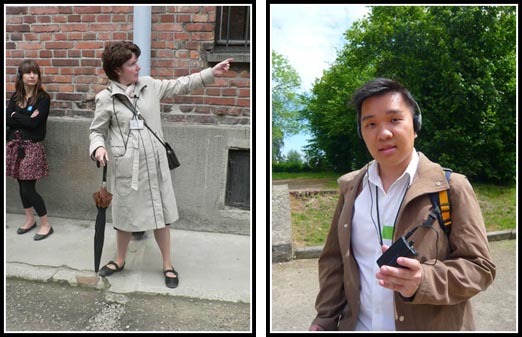 Due to the size of the tour group (about 20+), Auschwitz guides led their groups around using wireless transmitter. You will have to tune to the right frequency and maintain a right distance to hear from your guide. 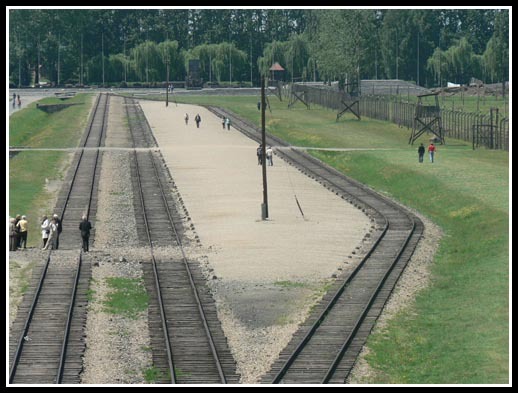 After a tour of Auschwitz I, we were bussed to Auschwitz II – Birkenau Concentration Camp. 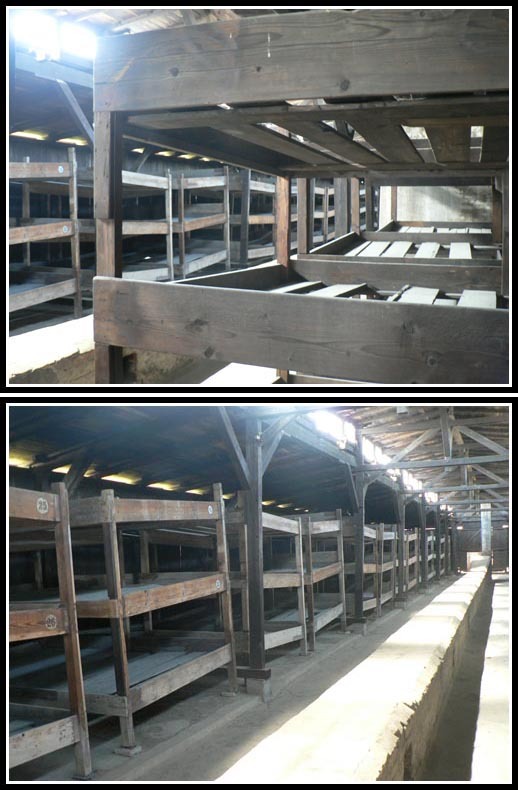 Unlike Auschwitz I, prisoners in Birkenau were housed in flimsy wooden shacks. 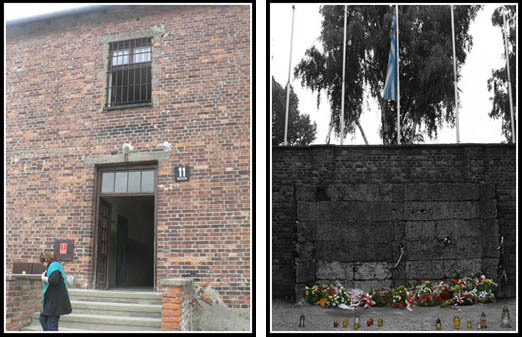 This camp was built to house the large number of Jews being transported from different parts of Europe to Auschwitz for the Final Solution (extermination of the Jewish race). 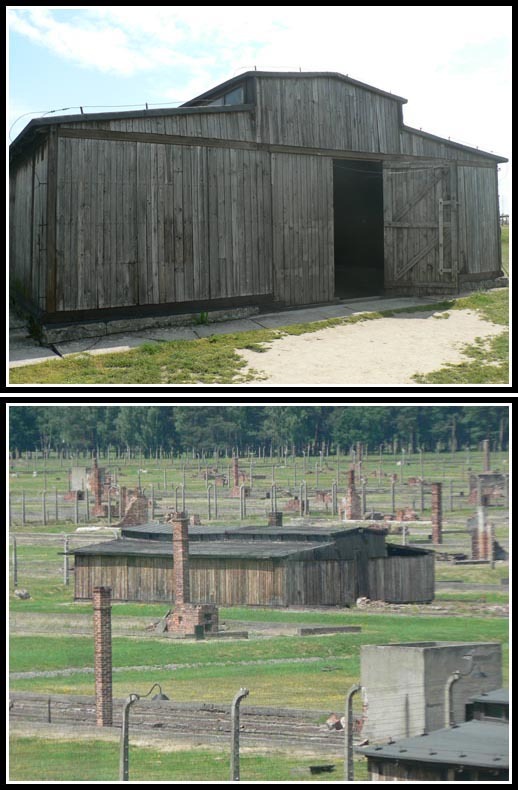 Most of the wooden shacks were destroyed by the Germans towards the end of the war to hide evidence of their atrocities. Only brick chimneys and a few buildings remained. 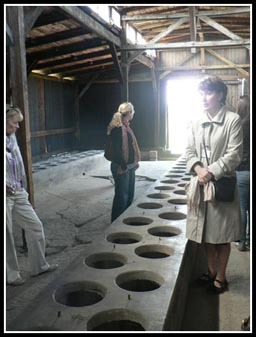 The guide showed us the latrines which prisoners get to use only once a day – before they set off for their work in factories around Auschwitz. Prisoners detailed to clean and maintain these toilets were the ‘lucky’ ones as they were spared from many of the beatings and abuse as the camp guards find this place too disgusting and smelly to enter. We were also showed the living conditions of the prisoners. About 6 persons squeezed into one deck of these wooden triple deckers. Despite the presence of a chimney, heating was almost never provided. These accommodation served as a perfect breeding ground for diseases and parasites. 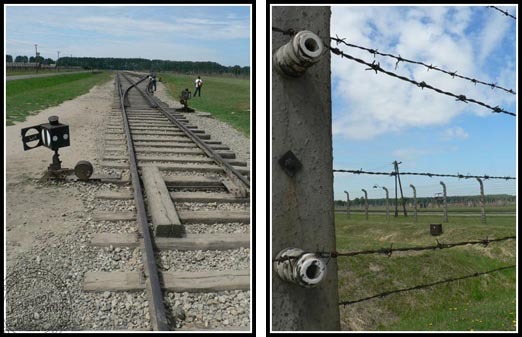 Hundreds of Jews were squeezed into small railcars and transported to this camp. Once they arrived, the camp doctor will separate out those who are fit for work and those who are not (e.g. children, pregnant women, old people, disabled). The latter were immediately sent to the gas chamber after being stripped of their possessions. Those fit for work were then shaved and sent to work in factories nearby. Platform at which prisoners alighted and were assessed if they were fit enough to work just by a cursory glance by the camp doctor. 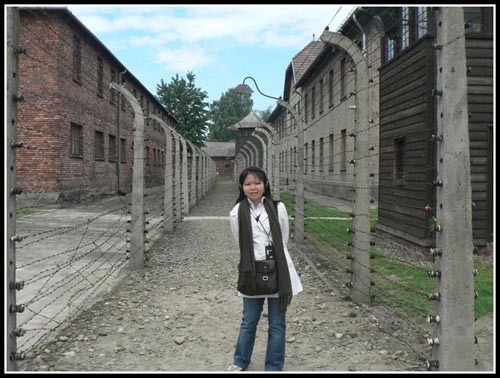 After this tour of Auschwitz and Birkenau, we were sent back to our pick-up point in Krakow. We proceeded to Galeria Krakowska for our lunch before we continue for our next day trip to the Salt Mine in 2 hours time. 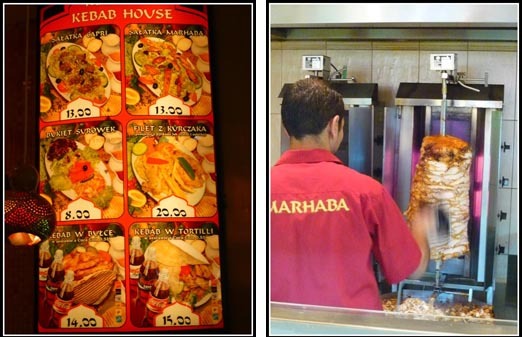 TY and I shared a huge Kebab with Tortilli meal for 15zł (inclusive of a drink) at Marhaba. The statue on Plac Matejki which you mention near the beginning of this post commemorates the victory by the Polish-Lithuanian Commonwealth over the Teutonic (German) knights at Grunwald in 1410. A big reenactment of the battle took place this summer (2010) at the battlefield. The Teutonic Knights, outsiders from the West whose ranks included knights from all over Europe (see Chaucer’s Knights Tale) were a dominant power in medieval Eastern Europe, but they were defeated by a coalition of Slavic knights. Aside from the Poles, whose king led the victorious coalition, the Germans and the Russians both attach great symbolic importance to the Battle of Grunwald and regarded it as a precedent for their gigantic struggles in World War I and World War II. I really like your website and enjoyed your articles on Krakow, which I know well.